The iPhone's camera has long been one of its most important features. Every year when new models are introduced, it's a sure bet that camera improvements are part of the package. Last year that remained true, but it also proved an even more special year for the iPhone's camera setup. The introduction of dual rear-facing cameras with Portrait mode was something different – pictures no longer just looked a little better than on older iPhone models, they looked almost professional-quality. This year, whether you picked up a new iPhone or not, Portrait mode is a better feature than before. Part of this is due to software improvements in iOS 11, but another key benefit is that third-party developers now have access to the depth information in Portrait photos. 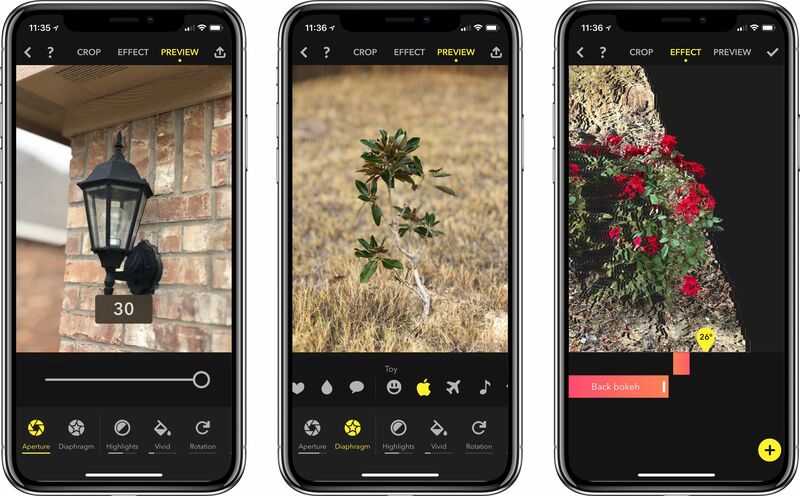 For the first time, Portrait images taken with the iPhone can be edited and enhanced in unique ways, and Focos is a new app that takes full advantage of that opportunity. Focos serves both as a camera and an editing app. You can take Portrait-style photos with it, but you can also edit all Portrait photos taken on an iOS 11 device. While I've tried several other apps that specialize in editing depth data in photos, Focos is easily the most powerful and intuitive. My favorite feature in Focos is the ability to easily change the focus point in Portrait photos. The effect is similar to what I've seen with Lytro cameras. All you have to do is tap the portion of the image you want in focus, and a shift will take place – the area you selected will come into focus, and the rest of the image will receive a blur effect. This works in real-time with images you take inside of Focos, but it also works with all existing iOS 11 Portrait photos in your library. It's a remarkable feature I'm planning to put to use any time my first attempts at capturing a Portrait image don't turn out perfect. Like the simplicity of selecting a new focus point for photos, Focos' full editing mode is similarly easy to navigate, as there are only two primary settings to adjust: Aperture and Diaphragm. The former will adjust the blur level in your image so it can be more or less blurred to your liking, while the latter adjusts the shape of that blur effect. This is where another piece of Focos' uniqueness comes in. The app includes standard shape variations like circles, octagons, and more, but there's also a section of fun shapes you can use like stars, hearts, and even things like the Apple logo. The effect is subtle, and in most cases you have to be looking for it to see what difference it makes, but it's a fun way to add extra flavor to your photos. If you want to tweak things outside of the simple Aperture and Diaphragm settings, you can do that, but Focos doesn't require it. The bulk of what you'll need most of the time lies behind those two simple settings. I do want to mention one more feature that's fun to play around with though: Effect mode. Tapping this option at the top of the screen will display your image in a 3D view powered by all the depth data embedded in the photo. You can pan around, adjust the bokeh, and see your image from a different perspective. If anything, it's worth trying just to marvel at all the depth information captured in a single photo. Focos is the most fun I've had editing photos shot in Portrait mode. It's easy to use, with an intuitive layout of controls and a handy set of simple video tutorials to accompany each tool. Plus, the power behind the app is impressive, allowing you to adjust focus in an image with a simple tap, or see all the depth data in the 3D Effect mode. If you have an iPhone that can take Portrait photos, Focos is definitely worth checking out. Focos is available on the App Store.